The Hitachi WR18DSHL 18V Cordless Lithium-Ion High Torque 1/2 in. Impact Wrench is the newest addition to Hitachi's 18V slide-type tool line-up. The WR18DSHL is a powerhouse, with a professional grade motor producing up to 1,500 RPM and 2000 IPM at 354 in-lbs. of torque. It featuring a tumble trigger for immediate forward and reverse direction selection, a built-in LED light for low-light areas such as mechanical shops and warehouses, and a battery fuel level indicator that minimizes frustrating downtime by helping anticipate battery swaps. 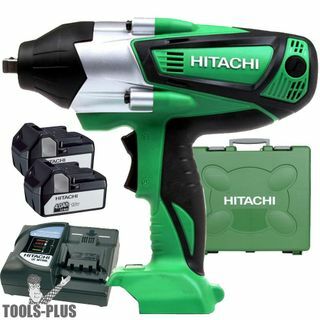 The WR18DSHL comes equipped with Hitachi's 4.0 Amp hour batteries, for 33% more run time without adding weight or size.